In the August issue, in terms of projects and techniques we have a lot in store for you, starting with John Bullar's article on recreating Ulrich joints. Rob Stoakley then shares his secrets for deconstructing a number of secret drawer ideas before David Barron shows us how he made his wall-mounted tool cabinet. Next, Francis Hallowes takes us through the steps or creating a lapped dovetail joint with a mitred top, followed by Michael Huntley's guide to the materials you will need for restoring pieces of furniture, before Geoffrey Laycock refurbishes a ball-pein hammer. 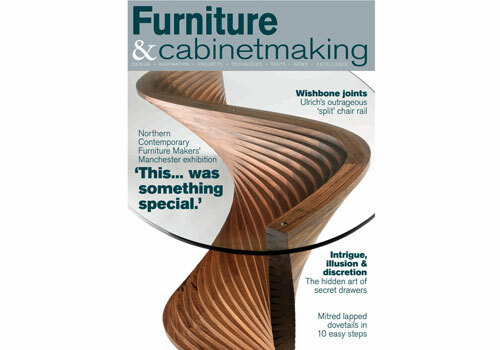 Our design and inspiration section sees Paul Mayon reporting from the 'Handworks 2013' show, which recently took place in Iowa and Derek Jones brings you the highlights from the Northern Contemporary Furniture Makers Exhibition. In our tests & equipment section, we have a look at the new Lie-Nielsen LA jack rebate plane before Robert Ingham turns his attention to a number of Ledin dividers & compasses. We also have our editor's round up with all the latest products on offer. As well as all this, we also have all the usual 'Your F&C' pages including news and events, details of the Triton Woodworker and Triton Young Woodworker of the Year competitions 2013, reviews and we also give you a sneak at issue 209. If you fancy saving up to 42% then why not download F&C to your iPhone, iPad or Android device? Click here to find out more.